Teachers and parents of children with autism are well aware of the more difficult aspects of autism. Children may avoid eye contact and social interaction and may have limited or reduced communication skills. Children with autism may have a short attention span for non-preferred activities, but may persevere on, or endlessly repeat, preferred tasks. They prefer routine, predictable tasks and may demonstrate challenging behaviors when routines are interrupted or unexpected events occur. One of the most heart-wrenching aspects of autism may be the struggle to establish mutually rewarding interactions between the child and parents. On the other hand, children with autism may demonstrate strengths that teachers and parents can build on. Show strengths in visual matching and visual and auditory memory, including memory for pictures, patterns, and words or phrases. They may demonstrate good sequencing abilities, nonverbal reasoning, visualization skills, and skills requiring use of rules, such as math and reading. Board games enable children to capitalize on these strengths and, at the same time, can help to create a means for parents and children to have a meaningful and enjoyable connection. Board games have many benefits for all children, but have special benefits for children with autism. Board games require turn-taking, social problem solving, attention to other players, sequential thinking, non-verbal reasoning, and allow children to practice developmental and/or academic skills that are incorporated into the goals of individual games. Looking at this list, one would think that board games would not be a good match for children with autism. However, board games also have many characteristics that make them appealing to children with autism. Board games have rules and the rules are set and predictable. That feels comfortable to children with autism. Actions are repeated, though perhaps with variations, in each turn. This aspect of routine and predictability is a motivator for children to repeat game play. Children with autism like repetition. Games involve turn taking, but most games do not require that players look at each other. Rather, the board is the focus of the game. Thus, children learn to wait to repeat their turn and begin to pay attention to others’ actions and comments in the interim. Board games are primarily visual, spatial, and tactile. Many children with autism are visual learners. Board games allow children to use their visual strengths, to analyze a situation, compare options, and determine a result. Children with autism may be able to see visual details quickly and remember them. They may be able to visualize spatial relationships or use visual-spatial memory to compare option for movement of pieces. This often places children with these strengths at an advantage in play on board games. Like all of us, children with autism like to do something well. Most board games involve some aspect of mathematics- counting, matching numbers, colors, or geometric shapes, or using patterns. Children who are higher level on the autism spectrum often excel at using math operations and seeing spatial or number patterns. Board games involving math concepts can allow children with these skills to practice, enhance, and demonstrate their knowledge. Games as a basis for developing emotional and social skills. Teachers and parents often struggle to find ways to connect with children with autism and help them have positive social interactions. Board games that draw children into group play through the game structure and/or content can provide the means for this connection. 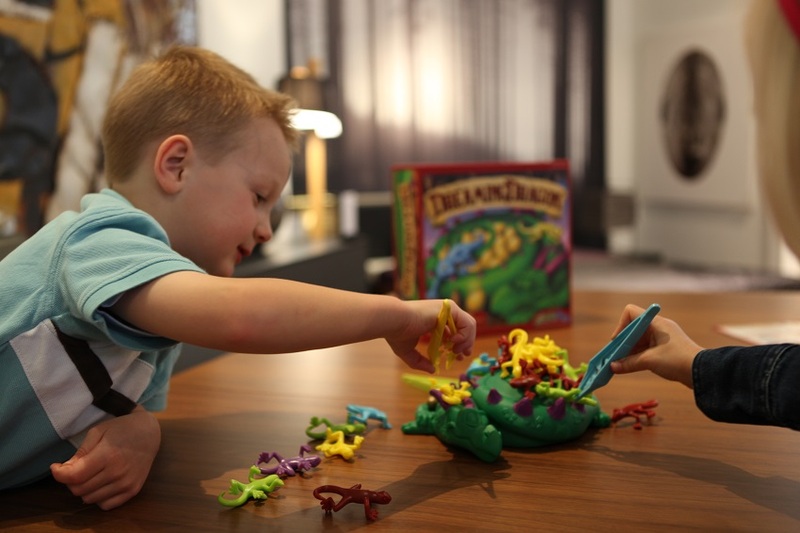 Board games are a source of fun and, thus, motivate children with autism to become involved in talking, watching, and often laughing with other players. If games are carefully selected to build on children’s interests and abilities, they can provide a framework to help children develop patience, tolerance for ambiguity, ability to recognize and regulate emotions, and a desire and ability to interact with others. Building emotional and social foundations will help children progress in all areas: developmental domains, academic content areas, and life skills. It is often difficult to know what games a child with autism or other special needs might like or if a game can be modified for the child’s abilities. The purpose of the SimplyFun challenges and strengths analysis is to help you make informed decisions about whether a game will be appropriate for your child. Each SimplyFun game has been analyzed to determine whether it might be a good fit for a child with autism, or similar characteristics. Parents can determine whether to choose a game based on challenges or strengths, or both. These two distinct views can be found in SimplyFun’s online catalog by selecting the product and then the autism details tab. The analysis enables you to examine a game related to each of the characteristics relevant for your child’s strengths and needs. First locate the game you are reviewing. Then identify the characteristics of autism that apply to your child. Challenges matrix: Indicates if the game is appropriate or inappropriate for a child with this characteristic to play. If it is appropriate, examples of modifications for making the game more enjoyable are offered related to the specific characteristic listed. After checking out recommendations for the characteristics that apply to your child, you will have a good idea whether the game, with suggested modifications, is a good match for your child. Strengths Matrix: Look for games that match your child’s strengths. Children love to do activities that are easy for them or offer an interesting challenge. Specific games have been identified that build the skills children with autism may demonstrate. Parents can use both views in combination to see if the characteristics of the child will need to be taken into consideration when playing a game that matches the child’s strengths. Bringing parents and their children together to share special moments of connection, helping children find pleasure in engagement with others, and discovering and expanding skills is the mission of the SimplyFun Autism initiative. Interested about learning more about Dr. Toni Linder and her work? Here’s her bio.